Matcha Green Tea is the tea that is used in the well-known Japanese tea ceremony which was established by Zen-master Sen-no-Rikyu in the 16th century. This is why Matcha is known as the ceremonial green tea of Japan. Every culture on earth has their own set of belief systems, and the Japanese are no different. The early temple priests were very much aware that there were energetic forces that affected much of their lives. Their simple diet and devotion to quiet meditation enhanced their innate ability to be sensitive to the world around them. 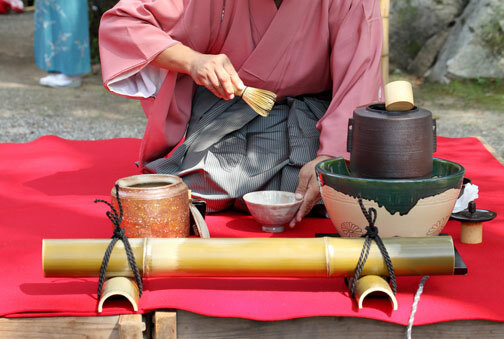 The tea ceremony acknowledged those energies, if you will, and the tea ceremony centered around 4 basic principles; Harmony (wa), Respect (kei), Purity (sei) and Tranquility (jaku). Every step, every movement, and every moment of the tea ceremony had meaning and purpose. Although traditionally the tea ceremony took place is a room specifically designed for it, the observance of this ceremony was in no way limited to this. The host seats facing toward the tea bowl (Chawan), tea container (Natsume), a Matcha whisk (Chasen) and a bamboo scoop (Shaku). The ceremony itself follows strictly defined principles. As the guests enter the room, the host will start to prepare the Matcha, in slow but stern motions. From the first welcome to the last sip of tea, and even the light conversation after, it all holds meaning in this sacred ceremony. Over the past 50 years the western world has become much more aware of the spiritual side to life’s existence, and as such, a greater appreciation for what we have. Matcha Tea is but one gift given to help man along his way in cultivating health and wellness. We are becoming more and more aware that the world we live in is a complex matrix that in itself, is a wonderful gift.